I had a very good day yesterday at the Arnold Bennett Society conference at Stoke-on Trent. I haven’t been to one of these annual shindigs since 2009 (I described that visit on this blog). Since then I’ve often wanted to return, but the conference date has clashed with other events where I have had standing commitments. No problem this year, so along I went. The theme was Arnold Bennett and his Friends and Acquaintances. A good subject, because the variety of the friends discussed clearly demonstrated how wide were Bennett’s interests and talents. We learned about his early collaborations with Eden Philpotts, his mentoring of the writer Pauline Smith and his friendships with Frank Swinnerton and Hugh Walpole, but also his relationship with the pianist Harriet Cohen, mistress and protegé of the composer Arnold Bax. This was a reminder of Bennett’s musical talent – he was a good enough pianist to convincingly play duets with her. Katey Goodwin’s mention of Bennett’s watercolours at the Potteries museum pointed to another of his talents. Bennett’s most famous self-help book is How to Live on Twenty-four Hours a Day, and he certainly made the most of his own bundle of twenty-fours. Catherine Burgass spoke about Bennett and the meaning of friendship. She pointed out that though his list of friends was enormous, he had a fear of friendlessness. In his serious novels, friends are few and opportunities are missed, while in the comic novels, friends appear like magical helpers to solve the hero’s problems. Paul Jordan shared the result of his research into a batch of Bennett letters archived at Leeds University. 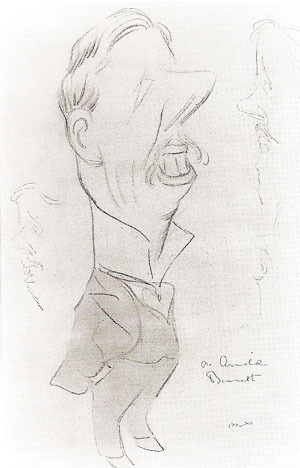 They are to his French friend Henry Davray, and give an unusual and frank picture of Bennett during his years in Paris. I was particularly struck by Bennett’s references to ‘cocottes’ he knew there. I have just been writing a piece on The Pretty Lady, and I think I might need to rewrite it slightly after hearing about this. Chitose Ikawa talked about the slight but very interesting relationship between Bennett and T.S. Eliot. Bennett spotted Eliot’s talent early, when he heard him reading ‘The Hippopotamus’. Eliot was less impressed by Bennett (and by what he thought was his ‘most disagreeable cockney accent’). Later they got on well, though, and Eliot, wanting to write a play, asked Bennett’s advice on construction. The play only half-happened, and the fragments of Sweeney Agonistes are the only remains of what Bennett referred to in a letter as ‘your Jazz play’. If he was wounded by Woolf’s article, he didn’t show it publicly, and in an Evening Standard piece assured readers that though everyone assumed the two of them were at war, they were in fact very good friends. He wrote critically about some of Woolf’s novels, though. My own paper was on Bennett’s friendship with the psychologist W.H.R.Rivers. Essentially it was an expansion of part of the chapter I wrote for John Shapcott’s Arnold Bennett Companion, but with some extra material about that slightly odd short story, Elsie and the Child, which I linked to Rivers’s ideas about the various human responses to threats. Afterwards there was a performance by Ray Johnson and, I presume, his wife. It was a collage of writing about the Great War by various authors, including Bennett. I wasn’t very convinced by it until Mrs Johnson sang ‘Keep the Home Fires Burning’ rather wonderfully. That song gets me emotionally where many better pieces of music do not. I arrived in Stoke on Friday afternoon, and took another chance to look around. Hanley town centre was busy, with the same pleasant, rather ramshackle feel that I noticed seven years ago. The big change is that Webberley’s has gone. This was a big sprawling bookshop of the kind that every town ought to have, full of surprises and with at least one well-stacked shelf of Arnold Bennett’s books. Now the shop stands empty. A few doors down there is now a Waterstones branch. I looked on their fiction shelves. No Bennett. I asked the slightly anxious-looking lady at the till. ‘They’re usually in Local Interest,’ she said. But there weren’t any. And that is the difference between a proper bookshop and a chain. I stayed in the George Hotel in Burslem. I liked it very much. It’s comfortable but a bit shabby, with memories of former glories. Like Stoke-on-Trent itself. Like England, I suppose. This entry was written by George Simmers and posted on June 5, 2016 at 7:40 pm and filed under academic, novels, Poetry. Bookmark the permalink. Follow any comments here with the RSS feed for this post. Post a comment or leave a trackback: Trackback URL. That’s a fine piece of writing, George, and makes a wonderful piece of Sunday reading. Did Eliot assume that any accent he didn’t recognise was a “cockney accent” or had Bennett lost his original – presumably Stokeian – regional accent without acquiring an RP accent? Eliot may not have had a very good ear for British accents and dialects. While his use of the demotic in The Waste Land has been praised, he was strongly criticised for the first draft of The Rock, in which the London workmen spoke stage cockney, rather than anything approaching the actual language of Londoners. He agreed to adapt it. Are there any recordings of Bennett? He lived well into the age of sound recording, and we have records of Shaw, Kipling and others from his period. But maybe he would have avoided recording; the stammer he never quite lost made him self-conscious about public speaking. Enjoyed your talk on WHR Rivers on Saturday. Pity we didn,t get an opportunity of a chat. In answer to your query about a sound recording of AB, see the ABS Newsletter Autumn 2007, Vol 4, No 5, my article ‘Good Old Nocker’ Forty Years On, pp11-25.